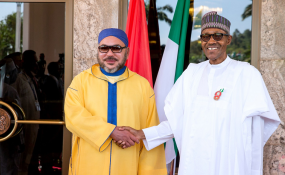 President Muhammadu Buhari and King Mohammed VI. The Peoples Democratic Party (PDP) has dismissed the image rescue effort by President Muhammadu Buhari before Moroccan Prime Minister, Saadeddine Othman, as a poorly packaged deception to sugarcoat his deep-seated disdain for Nigerian youths. The party said President Buhari's sudden praise-singing for Nigerian youth in far away Morocco is only a desperate afterthought aimed to reverse the public opprobrium he earned himself for his "lazy youths and lovers of freebies" comment, and not borne out of genuine regard for our youths. Unfortunately for Mr. President, our youths now know better and can no longer fall for his tricks. Every Nigerian is aware of President Buhari's disdain for our citizens and see his reported comments in Morocco as inconsistent with his known beliefs and dispositions. Nigerians recall that in a most recent gaffe, Mr President described the members of our National Assembly as idle and unproductive just as he dismissed our youths as unfit to run for Presidency in 2019, even while signing the "Not Too Young To Run" bill into an Act. Perhaps, this explains why his handlers resorted to heavily edited press statement on the Morocco visit. President Buhari should know that a visit to Moroccan Prime Minister cannot wash away the disgraceful invectives he openly poured on the energetic and vivacious Nigerian youths at the Commonwealth Heads of Government Meeting (CHOGM), where most of the world leaders were present. He would need another CHOGM in London to remove his lazy and lover of freebies stamp on our youths. The PDP is aware of the desperate bid by President Buhari to stop at nothing to beguile the citizens once again that election is around the corner. However, it is important to inform him that Nigerians now know his true colours and will reject any design to take them on a second ride to nowhere. President Buhari should therefore end his gimmicks and let go of straws. He should amply come to terms with the fact that the only expectation Nigerians require of him is to tender a direct apology for his abysmal performance and get prepared to leave the stage for a more innovative, and people-oriented President which Nigerians will elect on the platform of the PDP, come 2019.